Being Hoosiers, corn is about as necessary as air. 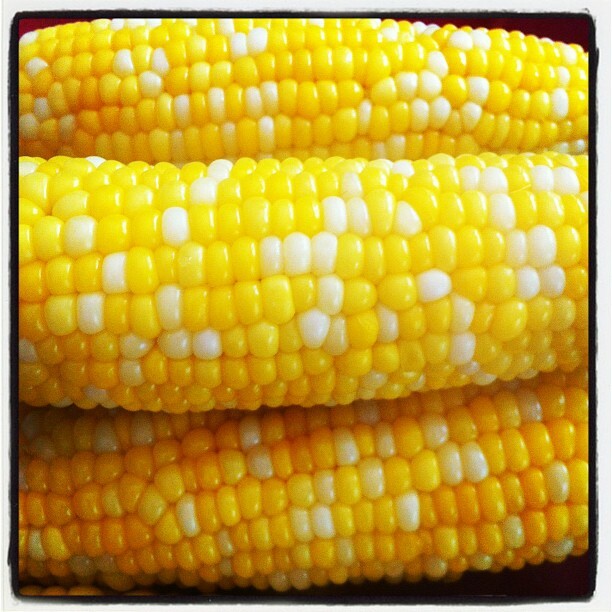 Last weekend was the first offering of sweet corn at The Broad Ripple Farmer’s Market, my favorite local summer farmer’s market. My Dad’s Sweet Corn is a religious experience. Their “baker’s dozen” bag is less than $10 and contains at least 14-16 ears of sweet bi-color Indiana corn. The kernels are large and juicy with the perfect crunch. I’ve spent nights dreaming of ways to prepare it beyond the typical boiled with salt and slathered in butter. I’m not the only one addicted to this Hoosier delicacy. My Dad’s Sweet Corn sells out multiple farmer’s markets each weekend around the state. One bag barely makes it from one Saturday to the next in our house. Is there a Corn Eaters Anonymous? Sign the Mullins family up. While water is heating up, shuck your ears of corn, removing all of the husks and silks. Drop the corn carefully into the boiling water. Set a timer for 6 minutes. Remove the corn from the water, let cool until you can handle it. 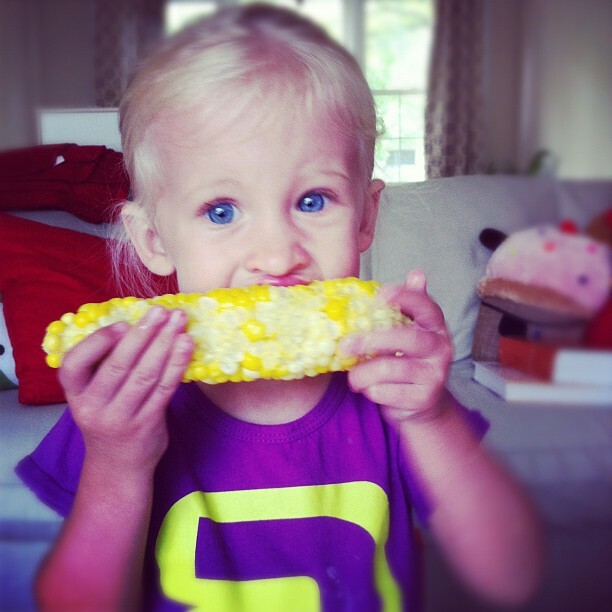 Growing up in rural Northern IL, sweet corn was a staple of both my diet as well as play! I’m just waiting for the first ears to show up in my local farmers market. As for alternate ways to cook sweet corn, have you tried grilling it? It is one of my favorite preparations. 2. Pull off the outer layers of the husk then carefully peel back the inner husk without taking it off. 3. De-strand the corn and re-wrap it in the inner husk. Ryan – grilling corn is definitely going to be happening. Corn season is only rivaled by tomato season! Hi Sarah! Thank you for butter tip. It sounds sooo good. I’ll try it! oh my, she is my Nola’s twin from another mother. we must get these two little girls together some time soon!